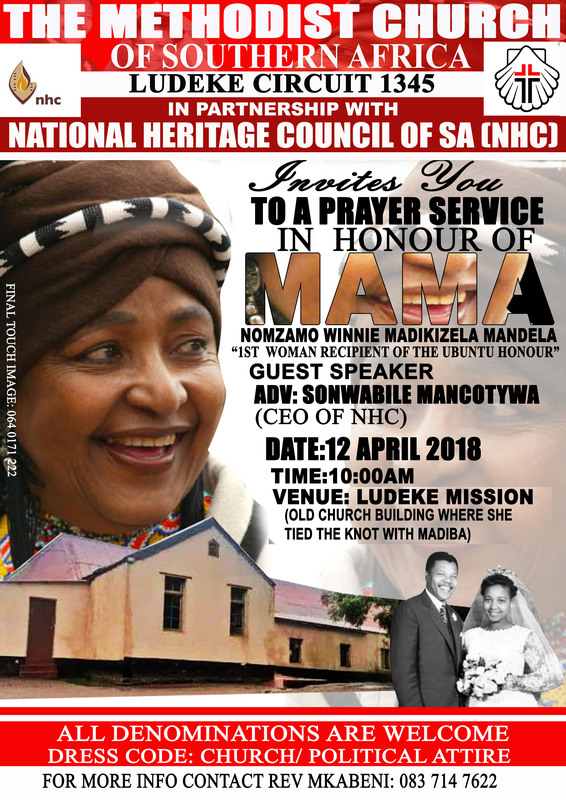 The Methodist Church of the Ludeke Circuit in Bizana, maWinnie Makizela-Mandela’s hometown, where she tied the knot with Nelson Mandela in June 1958 will host a memorial tribute in partnership with the National Heritage Council of South Africa on 12 April 2018 from 10h00. It is expected that 2000 people will attend the prayer service in honour of Mama Winnie Madikizela Mandela at the church grounds where the historic church structure is still standing firm although still in need of restorative work. “Among the many attributes of maWinnie, what stood out effortlessly was her custodianship of our history, culture and heritage. We wish to celebrate her life with the people whose culture moulded her foundational years,” says Adv. Sonwabile Mancotywa, Chief Executive of the NHC. She was the first woman to receive the Ubuntu Honour conferred to her in 2011 by the National Heritage Council of South Africa for her exemplary expression of the values of Ubuntu in her life. Only a few outstanding citizens of the globe were recipients of the Ubuntu Honour in the past years: Nelson Mandela (2006), Kenneth Kaunda (2007), Fidel Castro (2008), Boutros Boutros-Ghali and King Sabata Dalindyebo (2009), Miriam Makeba (2013), Julius Nyerere (2014) and Mfengu Makhalima (2017). Last year March, the National Heritage Council convened heritage state entities and stakeholders to assess the condition of the building for possible declaration as a heritage site. From Mthatha: Drive on N2 towards Kokstad and turn right at Phakade towards Flagstaff then Left at Magusheni (petrol station on your left). Drive until you see a sign that Garden of Remembrance which takes you to Nkantolo Village (OR Tambo’s Birthplace) this route takes you straight to the Church). You will see a big Church hall on your left. From Kokstad: Drive on N2 towards Mthatha. Turn Left at Phakade and follow the above directions. From Port Edward: Drive on R61 towards Bizana and do not enter Bizana CBD just drive straight until u see a sign that says Garden of Remembrance which takes you to Nkantolo Village (OR Tambo’s Birthplace) turn right at the sign and drive for a few minutes pass Ludeke JSS and near the clinic will be a big Church hall.